UM410 Mult Utilis Multus IV – X Ten four-way 3.5mm multiples grouped into pairs. Each pair is normalized together, providing up to five seven-way multiples. Standard 1U 19-inch rack panel. Also included is one RMS-1 screw set. UM410B Mult Utilis Multus IV – XLike the UM410, the UM410B has ten four-way mults, grouped into pairs, with a normally closed connection between them. The 'B' model, however, has the right-most 3.5mm jack replaced with a banana jack, allowing the 4-way mult to also function as a banana-to-3.5mm converter. The mult-pair acts as a 6-way 3.5mm mult with two bananas. The UM410B ships with one RMS-1 screw set. UM410+ Mult Utilis Multus IV – XLike the UM410, the UM410+ has ten four-way 3.5mm mults, grouped into pairs, with a normally closed connection between them, providing up to five seven-way multiples. Additionally, the UM410+ incorporates a 4-way mult board that provides a 1/4" insert, accessible from the back. The schematic of the 4-way mult shows connection and operation details. Two UM410+s can be used to bring all 8 CVs and all 8 GATEs from an ENCORE EXPRESSIONIST to a front-panel 4-way mult for each signal, with four 4-way mults left over. The UM410+ ships with one RMS-1 screw set. *NOTE: Currently, the UM410+ incorporates jacks with a metallic-silver ringed appearance rather than the solid black appearance pictured above. (These are the same jacks used in the UM410). 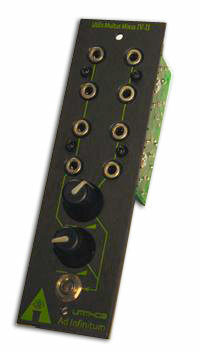 UMM402 MixerTwo four-way 3.5mm multiples with a passive mixer/attenuator. Single Frac-Rak panel.